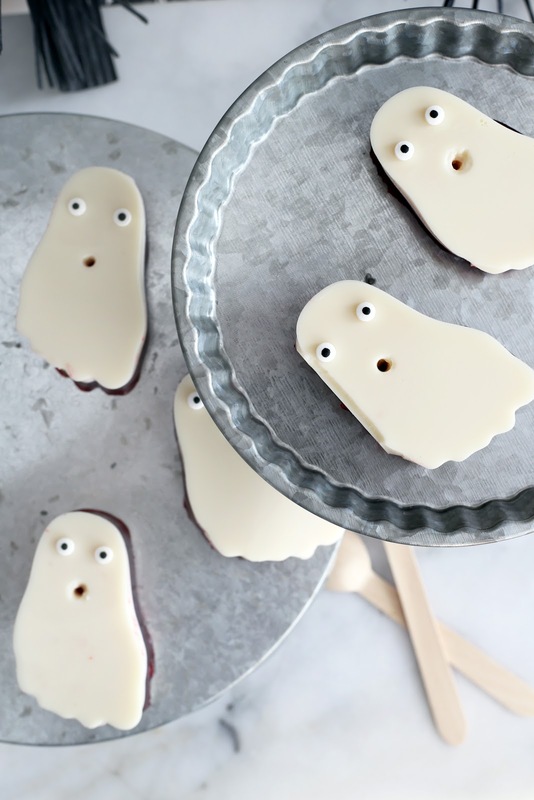 Cherry & Vanilla Boo-zy Ghosts! / Hey, EEP! 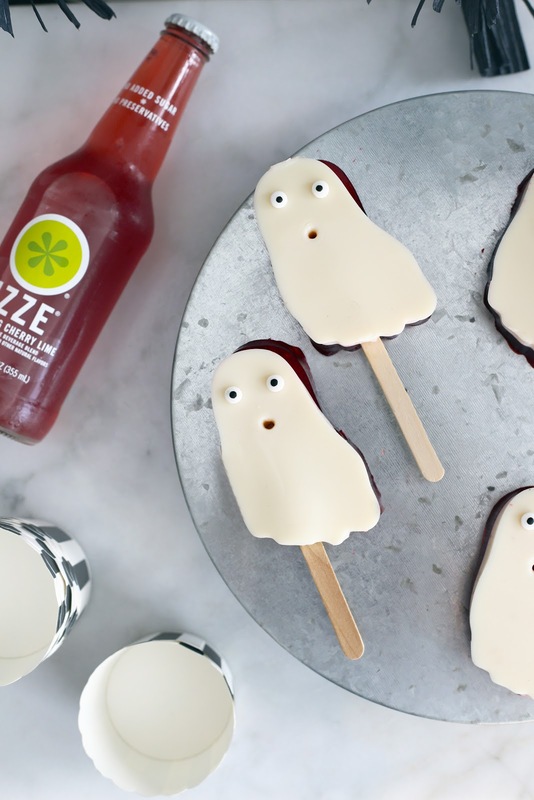 Cherry & Vanilla Boo-zy Ghosts! Remember college? In NYC it wasn't Halloween unless you went to the parade, got hit on by a few fireman and went to some crappy party with a fridge full of jello shots. I still connect Halloween with jello shots somewhere in my mind and although I haven't had one...maybe since junior year?...this October it's time for a comeback. Who's with me? Listen, I know jello shots haven't gone anywhere. 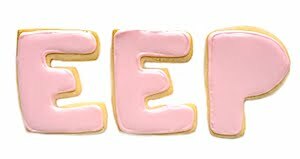 I feel like every time I'm on Pinterest I see some new fruit slice or berry filled with neon Everclear goo! But how cool are those layered shots that look like perfectly sliced soap!? The neat-freak in me goes crazy for that. 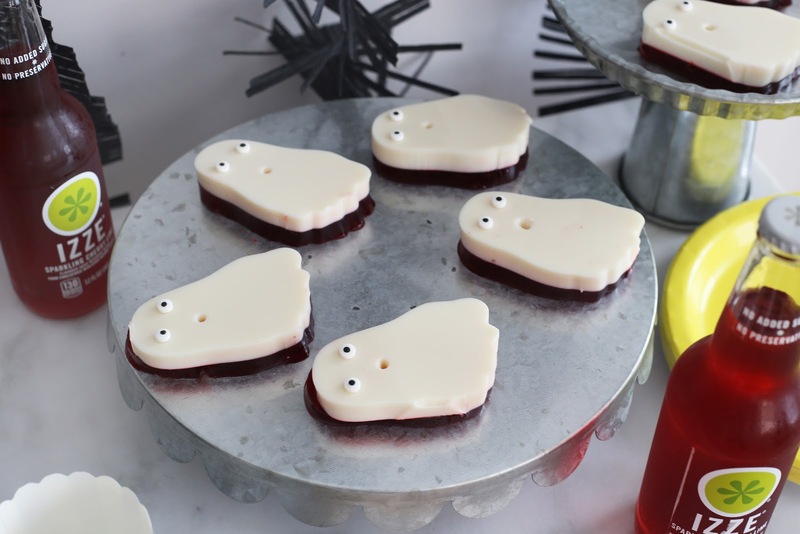 So, I decided to make ghosts out of red and white layered gelatin. The red base has to be cherry-flavored because obviously it's the best flavor! 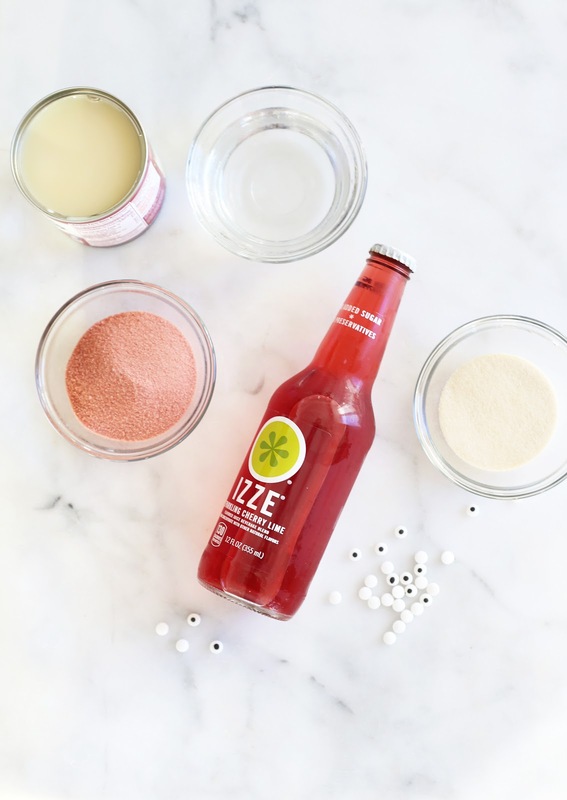 Instead of water I use vodka and IZZE Sparkling Cherry Lime which adds extra flavor without adding a ton of sweetness. Plus, the lime really enhances the cocktail-y taste, like having a lime wedge on your vodka-soda! Who doesn't love cherry-vanilla everything!? Am I crazy or are you with me on that? For the white layer, gelatin and sweetened condensed milk make the perfect creamy, dreamy topping. Add a splash of vanilla and it's even better. For the ghost shapes, I actually used a foot cookie cutter turned upside down. It's what I had. 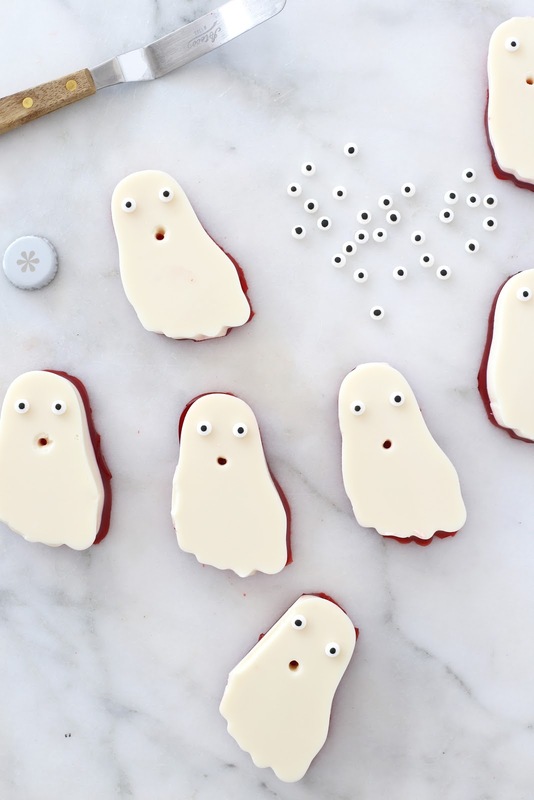 You can use a ghost cookie cutter, a foot, circle...whatever you want. Now there's a few ways you can serve these. Flop 'em on a tray, press a popsicle stick into the center or sit them in little candy cups with a spoon. I honestly couldn't stop laughing when I put them in these cupcake liners I found at the craft store because the shots wiggled whenever I moved them. Wiggly ghosts are the best ghosts! I say keep it simple if you're throwing a Halloween party. Make a batch of these, buy some Halloween candy (heck, steal it from a kid! ), put out some chips, IZZE and booze. No one's expecting a full meal. Of course you always have the option of eliminating the vodka. These could be little gigglers for the kiddos or anyone else just looking for a cute snack. Replace the alcohol with more IZZE Sparkling Cherry-Lime and you're done! What do you think, would you make these ghosts? Also...when's the last time you had a jello shot? I'm dying to know! 1. Lightly coat a square baking dish with nonstick cooking spray; wipe away any excess. 2. Put 1/4 cup cold water in a bowl. Sprinkle with 1/2 envelope unflavored gelatin and let sit until the liquid is absorbed. 3. Meanwhile, bring 1 cup IZZE to boiling over medium heat. Add to the gelatin mixture and stir until dissolved with no lumps. 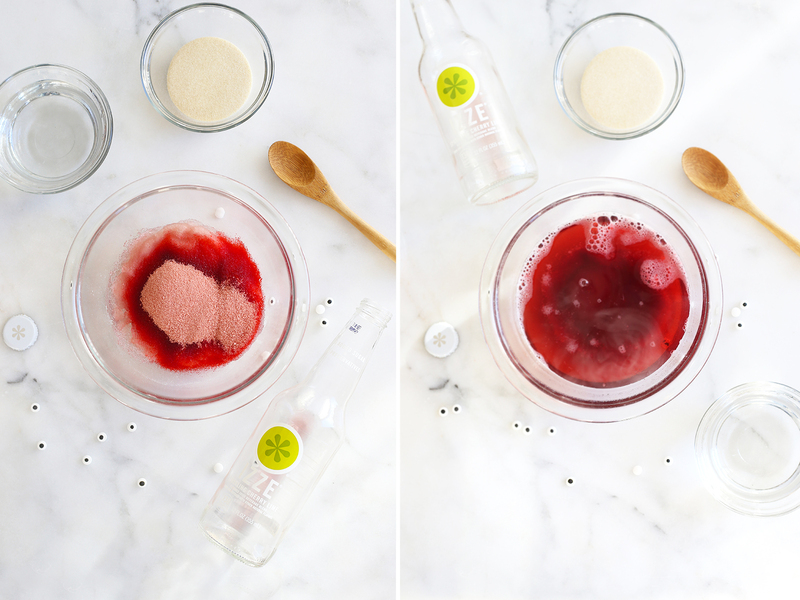 Stir in the cherry-flavored gelatin and vodka until dissolved and smooth. Pour into the prepared baking dish and refrigerate until firm, about 2 hours. 4. About 30 minutes before the cherry layer is done, put 1/2 cup cold water in a bowl. 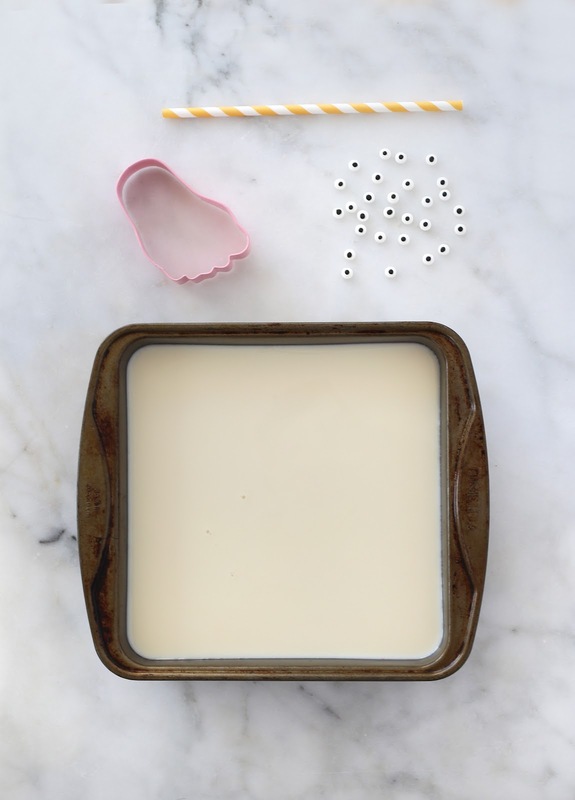 Sprinkle with 2 envelopes unflavored gelatin and let sit until the liquid is absorbed. Add 1 cup boiling water and stir until the gelatin mixture dissolves. Stir in the sweetened condensed milk until smooth. Let cool to room temperature. 5. Gently pour the sweetened condensed milk mixture over the layer of cherry gelatin in the baking dish. Refrigerate until firm, about 2 hours. 6. 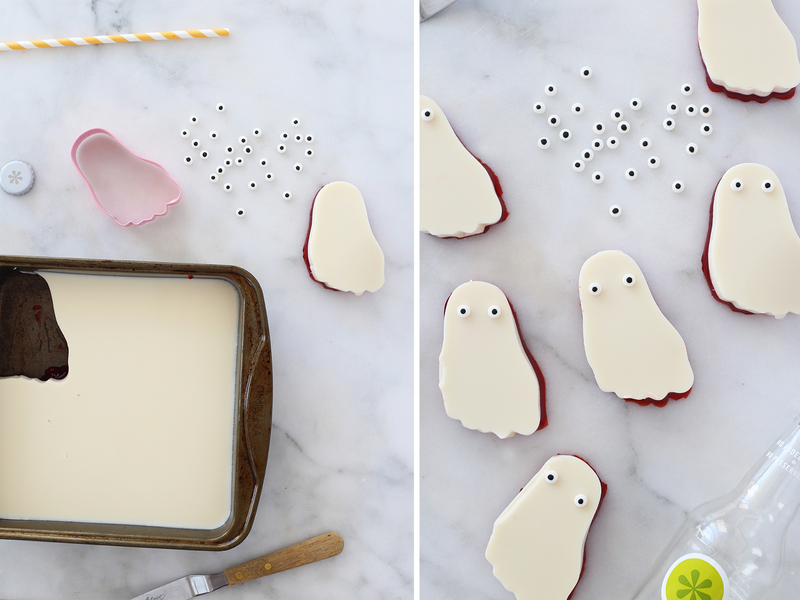 Cut out ghost shapes from the layered shot mixture using a cookie cutter; save scraps and cut into cubes for serving. 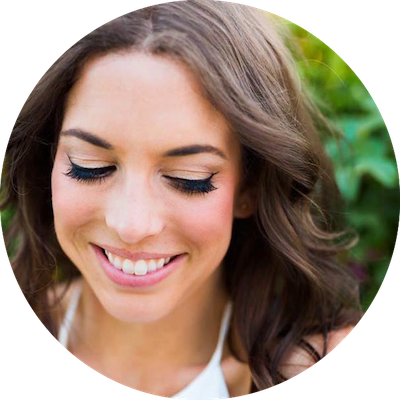 Add candy eyes and stamp out mouths using a straw. 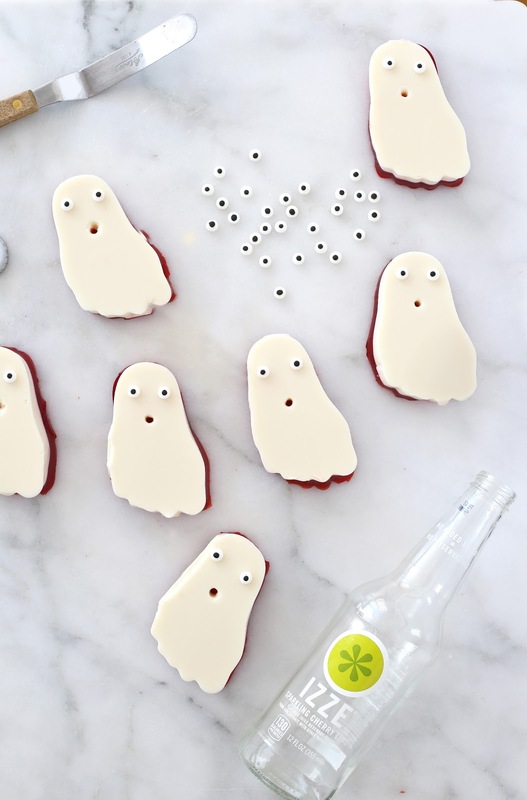 TIP: For boozier ghosts, double the cherry mixture (vodka included)!